Welcome to the 8th edition of my weekly BullCharts software Tip Sheets, focussing on tips and hints relating to the use of the Australian BullCharts charting software package. In the January edition of Brainy's eNewsletter Share Trading article (Document number ST-2500) I talked about how to select shares - that is, which company? and how to decide, and Blue Chips. In this Tip Sheet there is some more information about blue chip stocks (the feature article at right). And in the material below I talk about some of the features and properties of the Price Pane in BullCharts. If you have not seen my monthly e-Newsletter articles, you can see a preview (the first page of each of the four 4-page articles). Click here for more details about Brainy's Monthly eNewsletter articles (on Technical Analysis, Share Trading and BullCharts). The notes further below refer to the screen shot here (click on it for a larger version). The very first thing to note is that this screen shot appears to be a window of its own, with the blue Windows title bar across the top. If this was "maximised" within the BullCharts window, you would not see the blue title bar; but all other features are pretty much the same. The steps to "maximise" and "restore" this price chart in the BullCharts window are exactly the same as in other Windows programs. It is easiest to use the three small "buttons" in the upper right hand corner of the window - the first one will "minimise" the window and "restore" the window; the middle one will "maximise" and "restore" the window, and the right-hand one (the cross in the red square) will close the window. Note that this Price Chart has two Price Panes - the price plot itself, and the volume pane in the lower portion. You can right-click the mouse on either pane for a dialogue box of properties options for the pane (more details below). You might also notice that this price plot has a large amount of space to the right. To change this, right- click over the time axis and select "Time Axis Properties", then enter a value for "Space to the right of chart". Across the top of the price chart window in the blue Windows title bar there are a couple of pieces of information (assuming that the window is "restored" and not "maximised"). If you have "saved" the chart as a file (using the menu option File > SaveAs), then the first piece of text is the name of the saved file. In the sample above, the filename is "BHP_demo.bc"
"BHP" - is the next piece of text in the sample above - the stock code. 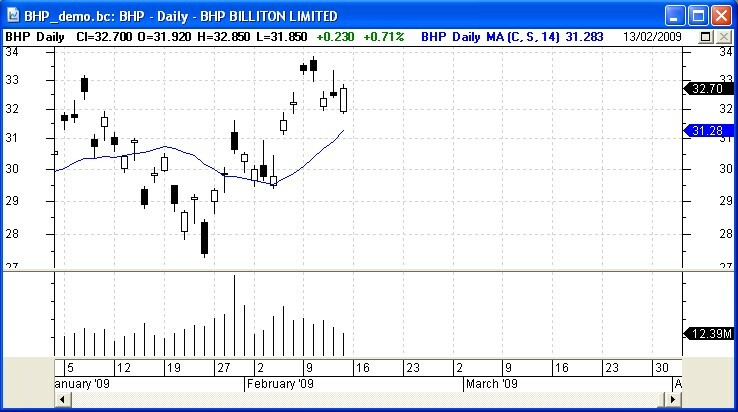 "BHP BILLITON LIMITED" - the name of the stock. You can right-click on any pane on the price chart, and select "Pane Properties..." from the drop down menu. The dialogue box is as shown in the accompanying screen shot. One good way to understand each of the options is to play with them and note the effect they have. Some of these are covered in the text below. Just under the blue Windows title bar is the title bar for the Price Pane. It is possible to turn off the display of this pane title bar - right-click any where on the pane and select "Pane Properties" from the drop down menu, then "Show pane title bar" can be turned on or off. In the sample screen shot above there are a number of pieces of very useful information as follows. "BHP Daily" - The stock code, and time frame. "Cl=32.7000 O=31.920 H=32.850 L=31.850" - These are obviously the Close, Open, High and Low price. What might not be so obvious, is that these prices refer to the very last candle on the chart. 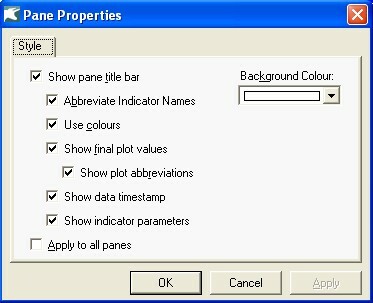 These can be omitted from display (in Pane Properties > "Show final plot values"). "+0.230 +0.71%" - These two values are the price change between the last candle and the one before (in dollars, and in percent). So if you want to quickly know the amount of price difference on the chart between the last two candles, simply look at the price pane title bar. 14 - The MA is a 14 period MA. 31.283- This is the actual value of the MA for the last candle on the chart. Note that with several indicators shown on the chart, the codes and parameters for each of them will be displayed and might run off the right side of the screen (unless you have a nice wide screen). The sequence of these across the screen can be changed. The very first entry is normally the price plot details, because this chart element is actually drawn on the chart at the "back" of the chart. That is, it is "behind" the other elements. You can change the sequence of items on the chart by moving one "forward" or "back". To do this, left-click once on either the price plot itself, or on an indicator, to select that element. Once it is selected some "handles" will appear along the element (the handles are small squares). Now right-click on the element and from the drop-down menu select "Order", and then choose an option. (Note: this is exactly the same as in Microsoft Powerpoint, and OpenOffice Impress - except it might be called "arrange" instead of "order"). Perhaps you are an experienced trader, with one (or more) successful trading strategies, in which case the tip below might not be too useful. But if you are trying to work through the mine field and work out how to search through all the available stocks, there are some resources available to help. To help narrow down your selection of companies, you could focus on companies that are in good health, with good management, who produce profits year after year. There are a number of resources available to help with this. The Lincoln Indicators company has a product called Stock Doctor. Stock Doctor is available by subscription, and is a very good tool to search through stocks based on company fundamentals. The software has a number of criteria that are used to rate companies as "quality" companies, and rate the better ones as "Star Stocks". You should see their web site for more details. There are a also a number of books available each year to assist. One of these is Martin Roth's "Top Stocks". If you are trying to distinguish which companies are "quality" companies, then this book will help. It is available from Janene's Educated Investor bookshop in Collins Street, Melbourne. See this web page for details.